So much happened when Christ died for our sins – not just on earth but in heaven. Could we stretch our minds to encompass some of that higher drama? To do so, return with me to Jerusalem, and imagine the story that two of that great city’s hills – Mount Moriah and Golgotha – could tell. Mount Moriah was a grand and regal hill, boasting a star-studded history. How many mountains could brag about Abraham’s raised knife and his son’s quiet faith? Now the mount proudly wore the magnificent temple that Herod built. The pearl of the City of David, the center of Israel’s faith, jutted toward the sky in gleaming splendor. Now its priests busily prepared for the Passover celebrations. Probably just three thousand feet away stood Moriah’s diminutive half-brother, Golgotha. Golgotha didn’t even count as one of Jerusalem’s seven hills. By appearance, it was plain. By history, it was despicable. But by destiny, it was about to become glorious. For you see, while the priests scurried about the temple on Moriah, preparing to enter the Holy Place, Golgotha was about to host the High Priest of heaven. 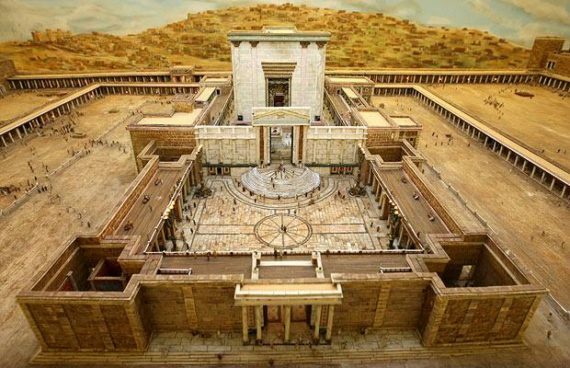 With sandaled feet, the Rock of Ages was scheduled to walk onto the rock of shame and step into the eternal Holy of Holies, into the temple of the Living God. In Herod’s temple, the priests had become quite adept at offering a day’s worth of sacrifices without soiling their garments with goat’s blood. In a moment, on the hill of ignominy, the eternal High Priest would come to perform His sole task: to spill His own blood shamelessly onto Himself and wherever else it would happen to fall. The two hills could not have been more different. By all appearances, Mount Moriah for its temple was clearly glorious and admirable. But no one would want to visit the ugly hill of Golgotha. 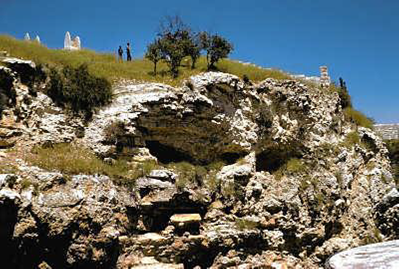 Isaiah the prophet knew how unsightly a place Golgotha would be. He foretold how disfigured the High Priest would become on that hill. The ancient prophet knew that the Messiah would be mauled, displaying neither beauty nor majesty. Instead, He’d be despised and rejected by men. Man of sorrows. Familiar with suffering. Like one from whom men hide their faces. Stricken. Smitten. Pierced. Crushed. Oppressed and afflicted. Let like a lamb to the slaughter. But Isaiah also knew there was a purpose for all the ugliness. Jesus would take up our infirmities. Carry our sorrows. Be pierced for our transgressions. Crushed for our iniquities. The punishment that brought us peace was upon Him. By His woulds we are healed. The Lord has laid on Him the iniquity of us all. That’s why Moriah, the regal mount, deferred to Golgotha that day. Call it a passing of the baton. Think of it as a recognition of greatness. The shadow bowed to the substance. The copy yielded to the original. The earthly acquiesced to the heavenly. The temple applauded the Sanctuary. The worship on Moriah grew dim in the spiritual realm that day, lessened by the increasing brilliance that shone on the Redeemer. Perhaps, like John the Baptist, who said, “He must increase but I must decrease,” the Temple tipped its hat to the heavenly High Priest on the hill called Skull. And maybe the Sanctuary saluted back to the stone and bronze, acknowledging a job well done, releasing it from its duty and accepting the immense responsibility on Himself. Though no mortal noticed it, heaven’s eyes could see that the golden lampstand beamed a smile over the wall to the Light of the World. The table of showbread turned over duties to the Bread of Life. The golden altar of incense giggled with delight at the fragrant offering ascending over Golgotha. The Ark of the Covenant sighed deeply with relief that the new covenant of the heart had finally come. And the cherubim who covered the mercy seat joyfully fluttered their golden wings at the deluge of grace raining down and washing away condemnation. Caiaphas, the high priest on Mount Moriah, didn’t have eyes to see this phenomenal display. He had missed his true calling. What should have been the grand climax of glorious centuries of preparation turned out a dismal failure of perception. So thick were the blindfolds that the high priest didn’t know that his heavenly counterpart, the true High Priest, was even now within the Holy of heavenly Holies, offering once and for all the sacrifice for all of humankind’s sin. But the High Priest of the new covenant didn’t require the acknowledgment of the old. The new Mediator bridged the gap single-handedly. Job well done, O bulls and goats of the sacrifice! You pictured Him well. You pointed the way. O you tender lambs of the ages, you who gave your lifeblood helplessly. Look, see Him there, the fulfillment of your prophecies. The Lamb of God takes away the sin of the world! Photo credits: Herod’s temple: telegraph.co.uk.